Feb. 9, 2012, 3:30 p.m. The Journal has found the perfect story for two image-heavy social networks. By Andrew Phelps Feb. 9, 2012, 3:30 p.m. The incredible growth of Pinterest — the (invitation-only) social bulletin board dominated by young and female users — hasn’t gone unnoticed by news organizations. Like Tumblr before it, Pinterest offers the chance to reach massive, sharing-oriented new audiences — but also requires a different, more visual kind of editorial thinking. The Wall Street Journal is giving it an early try by looping in another booming young social app. The Journal has deployed nine journalists to cover Fashion Week in New York, all armed with iPhones and Instagram accounts. They are encouraged to file constantly. (For fashion reporters, capturing photos is a form of note-taking.) Their tweets and images are automatically pulled into the Fashion Week section of the Journal’s website. The best ones are featured on Pinterest and re-posted on the Journal’s main Instagram account. The two social networks are perfect companions. Pinterest is a “really fast-growing social network that a lot of people are super-excited about,” said WSJ social-media editor Emily Steel, who used to cover digital advertising and marketing for the paper — “a lot of people both in the digital media/marketing/tech world, but also consumers who are really into fashion and arts and crafts and food.” In other words, people who may not be big Journal readers. I was embarrassed to tell Steel I didn’t know the Journal even covered fashion. The Journal’s Fashion Week pinboard has attracted about 900 followers so far. The Instagram account, a few weeks old, is approaching 8,000 followers. Steel said she took notice of Pinterest users sharing WSJ content among themselves. A few weeks ago the Journal started building out its own Pinterest boards — a board for hedcuts, those famous dot drawings of newsmakers; a board for historic WSJ front pages; a board for WSJ Magazine covers. Sometimes it feels like social media moves as fast as fashion. At this time a year ago, Instagram was almost brand new but had already signed up more than a million users. Pinterest was barely on the radar. Today Instagram has 15 million users and signs up a new user every second, according to the company. This month Pinterest reached 11.7 million unique monthly U.S. visitors, according to data obtained by TechCrunch, “crossing the 10 million mark faster than any other standalone site in history.” Visitors spend an average of 98 minutes per month browsing that site. Jeff Sonderman said “it’s time for journalists to pay attention to Pinterest,” with its loyal, distinct audience. Time, LIFE, Newsweek, PBS NewsHour, and Mashable are among the other news outlets dipping their toes in the water. POSTED Feb. 9, 2012, 3:30 p.m.
Phelps, Andrew. 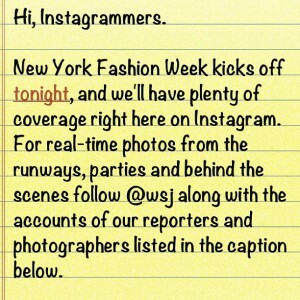 "The Wall Street Journal covers Fashion Week fashionably, finding uses for Pinterest and Instagram." Nieman Journalism Lab. Nieman Foundation for Journalism at Harvard, 9 Feb. 2012. Web. 19 Apr. 2019. Phelps, Andrew. "The Wall Street Journal covers Fashion Week fashionably, finding uses for Pinterest and Instagram." Nieman Journalism Lab. Last modified February 9, 2012. Accessed April 19, 2019. https://www.niemanlab.org/2012/02/the-wall-street-journal-covers-fashion-week-fashionably-finding-uses-for-pinterest-and-instagram/.